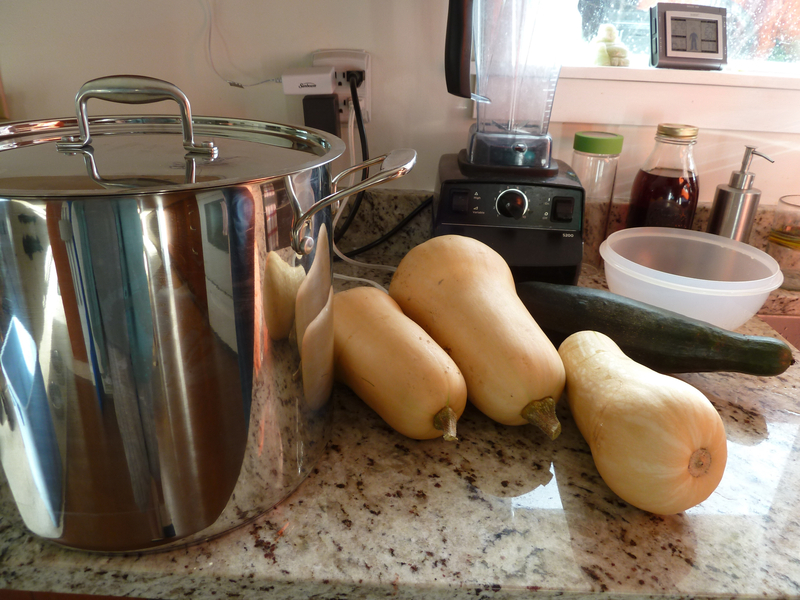 My Home and Garden: It's Butternut Squash Soup day!!! It is our annual ritual making enough Butternut Squash Soup to last the whole winter. This year is especially special!!! These are our home grown Butternuts, the apples came from our tree and the herbs were from my garden. Next year I am going to make my own vegetable stock. My mother has a wonderful method. She keeps a bag in her freezer and all year tosses in clean peelings and scraps. So rather than using fresh vegetables to make stock, she uses what would normally not get used. There are a few things that you don't use, like beets for obvious reasons. I will post the method at some point. When I went to pick some rosemary, look what I saw. 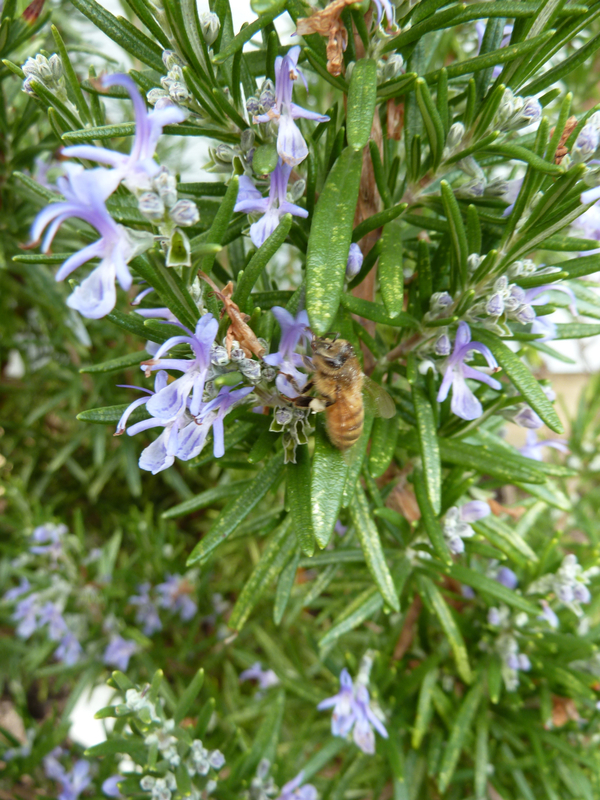 Lots of lovely purple blossoms and it was buzzing with honeybees. 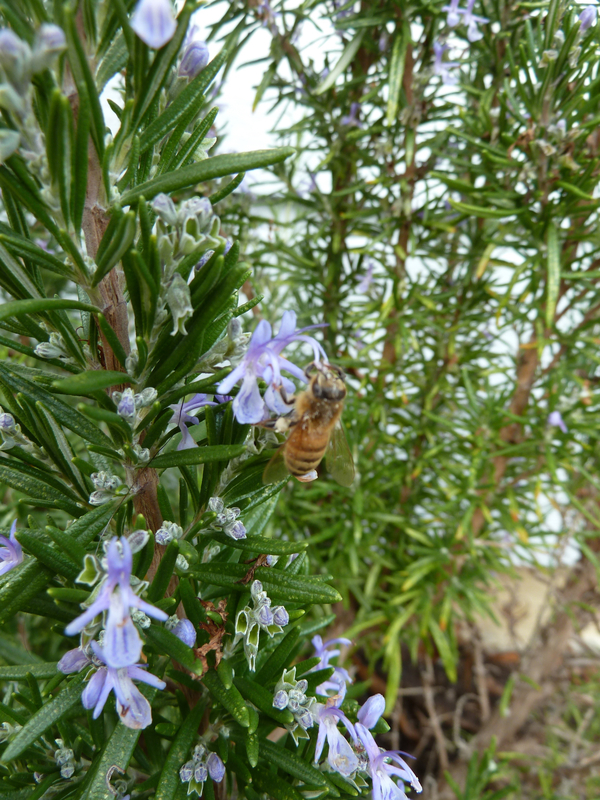 HONEYBEES!!! I had to run for the camera to show you. Anything you can get flowering into the late fall and winter, helps our little foragers. Here is the soup pot full of beautiful, yummy and healthy ingredients. There is something deeply satisfying about making soup. We love to have it for supper on winter nights. Allan likes his with Toast that he dunks in it. I prefer...just the soup. Heat oil in a large pot. Sauté onions and garlic until soft and fragrant. 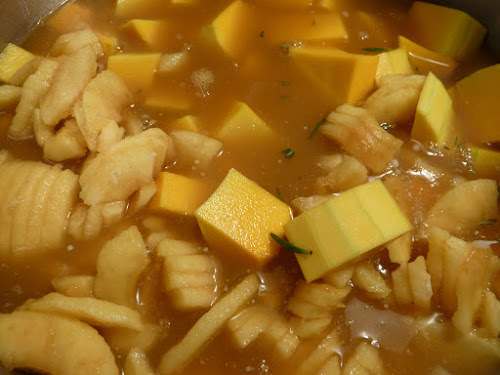 Add squash, sweet potato and apples. Stir to combine. Add the remaining ingredients. Bring to a boil. Reduce heat, cover and simmer for 30 minutes or until squash is very soft. Purée soup. I use a stick blender, but you must be very careful if soup is hot. I still manage to splash molten soup on myself every time. I'm going to let it cool first this time. Your recipe sounds delicious. I've starting making double batches of soup, one to enjoy and one to freeze for later. I like the idea of adding apples, one that I'll try out. I love to make soup in the autumn - currently making butternut/carrot soup and beetroot/sweet potato, both absolutely delicious. I'm a dunker, like your husband!